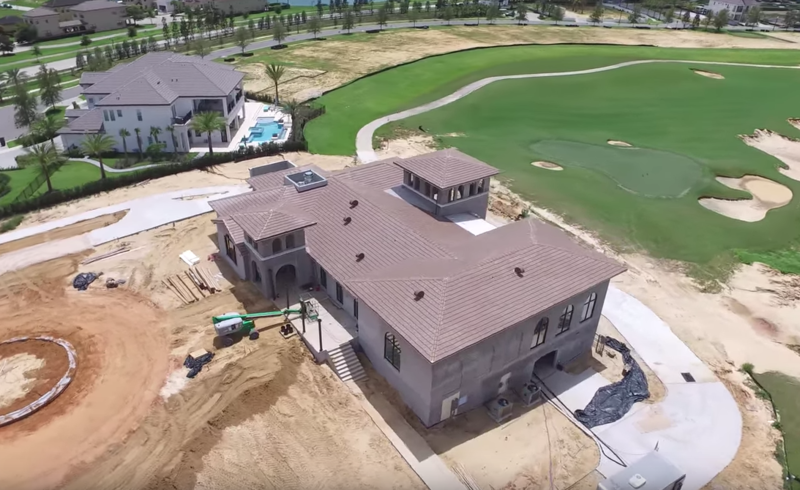 Most of the requests over the summer have been for an aerial construction update of the Nicklaus course clubhouse, so how can we resist? Taking to the skies this morning, we saw lots of building progress including the driveway circle, tiled roof, sliders and ground floor windows. The Nicklaus Course Clubhouse will be open to all guests and owners within Reunion Resort, much in the same way as the Reunion Grande clubhouse over at the main resort building. This stylish looking 19th hole will prove to be a popular destination for sunset drinks and delicious snacks throughout the days and evenings at the resort. We expect to bring lots more detail, but for now, we are sure that you will enjoy the view and dream of what’s to come soon to the Jack Nicklaus course area! The Nicklaus Course Clubhouse is situated over towards the Sinclair Rd entrance to Reunion Resort and is within easy walking distance from Golden Bear Dr, Whitemarsh Way, Loxahatchee, Muirfield Loop, Palmilla Ct etc. Previous Homes For Sale In Reunion Resort – 5 Bedroom Traditional Dream Home!